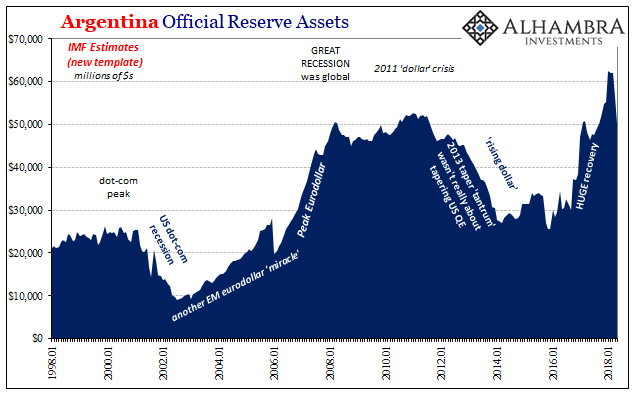 The reasons why the IMF stepped in to rescue Argentina were perfectly clear back on June 8. The peso was in freefall and though the Argentine government had spent two years fortifying the country’s reserve position, by borrowing heavily in the Eurobond market, that was merely orthodox thinking. Reserves are widely believed to be something like insurance. 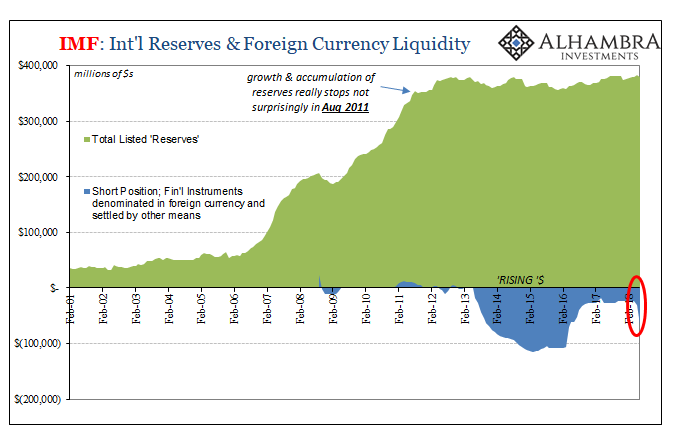 According to the IMF, in April and May 2018 alone Argentina “spent” $11.9 billion of its total reserves trying to arrest the peso’s plunge. 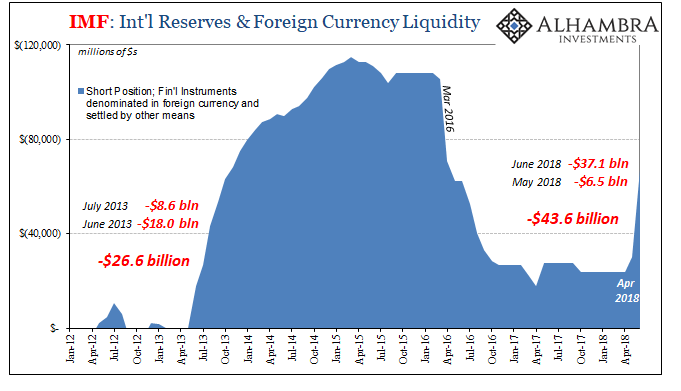 Given that their total balance was $62.0 billion in March, with one-fifth of their reserves disappearing without the peso slowing let alone stopping the IMF bailout was simply inevitable. No complex mathematics were required to see where it was going. Why isn’t Argentina being accused as the Chinese are of currency manipulation? After all, this is just export “stimulus”, right? It’s one question Economists will have to surmount if they are ever to stop this global upturn/downturn cycle, to see it as the false excuse that it is. And it’s not really all that specific, either. Argentina’s problem is the same one as China’s – or Brazil’s. There is no reason whatsoever the level of Argentine forex reserves should so correctly outline Brazil’s major stock market index (above). None. 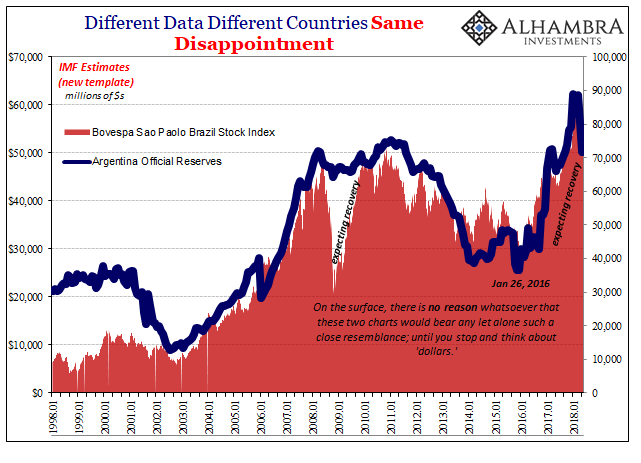 Unless you take account of how the eurodollar system works, and what it means when Argentina’s reserve balance rises (“reflation”) and when it falls (deflation). These are global not local variables. The Bovespa Index would register a record high of more than 87,000 on February 26, just as the peso was becoming interesting. As Argentina’s reserves bled staunchly from its central bank accounts, so, too, did Brazilian stocks register the “dollar” turmoil.  By June 18, the index was down a sharp 20%. Not only were share prices crashing for Argentina’s neighbor, starting around April 18 the Brazilian real would “devalue”, as well. 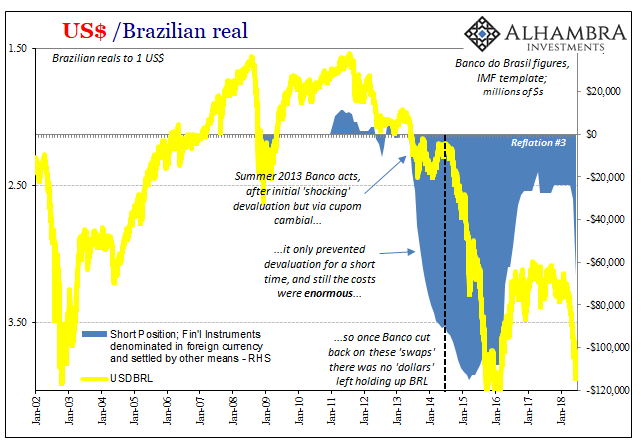 Like ARS, BRL’s collapse didn’t provoke any trade war rhetoric, just the usual central banker promise to intervene however might be required – without once mentioning the massive scale of its prior currency rescue that failed miserably. June 18 was an interesting day for Brazil, one which I chronicled with well-deserved snark. That was the day some anonymous central bank source in or connected to Banco do Brasil claimed the central bank’s intervention just couldn’t go on for very long. The implication was that it had already expended a huge amount only to keep BRL somewhat steady around 3.80. For Brazilian stocks, perhaps counterintuitively, this news seems to have triggered a pretty substantial rally. From a low just less than 70,000 on June 18, the Bovespa has retraced to around 78,000 almost in a straight line. Stock investors were apparently enthused by the purported lengths central bankers will go to further wreck their system. I think it demonstrates pretty well the standard pattern for these kinds of things. Whenever a central bank mediates directly in the short run it appears to work and often work well. There is a “don’t fight the Fed mentality” that instantly materializes from the first central account clearing trade. A window of calm opens which then is taken as validation of the official position (though it is circular logic). It doesn’t usually last, however, for various reasons but in broad terms because it soon becomes clear these guys have no idea what they are doing. They can throw billions upon billions at a problem, but they really don’t know why or for what. The textbook says use your reserves if you have to, but that’s where the chapter on it ends – not begins. Subsequent data has revealed the staggering depths of this initial stage of Brazilian “currency manipulation.” Whoever it was back on June 18 they weren’t alarmed enough. According to Banco’s figures cataloged in the form of the IMF template, in the month of June alone the scale of “swaps” was more than $37 billion. It doesn’t look like a huge amount on the chart above, but it was way, way more in that one month than in any of the biggest two months during the 2013-14 intervention. Since it followed a small-scale program in May, the combined $43.6 billion in accumulated short positions is astronomical. I can’t say for sure exactly why Brazilian shares were bid, but I doubt central bank panic was or is at the top of the list. Once more we are confronted with asking the right questions and finding only the wrong answers. What was accomplished? BRL seemingly stable ~3.80 isn’t stability at all. They can’t keep it up for very long (the intended message of the June 18 leak) the best it might do is buy some time, but time for what, exactly, to happen? 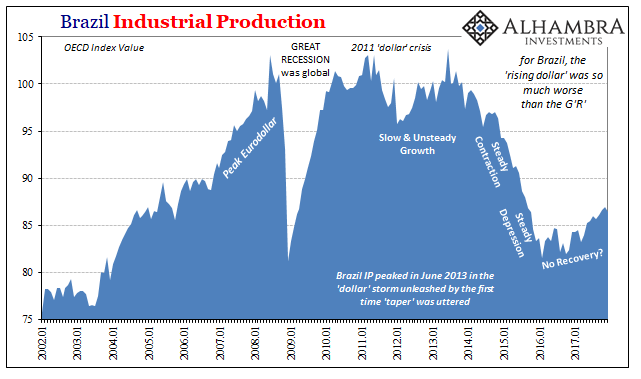 I wrote back in August 2013 close to the start of their prior effort quite flippantly and somewhat callously that Brazil May Already Be Toast. Brazilian officials just didn’t know what they were getting themselves into, facing down a eurodollar storm of unknowable proportions by, essentially, subsidizing Brazilian banks in the eurodollar business. What was going to get them into big trouble, why they were toast, and the Brazilian economy by extension, was the possible backlash it set up. The last place you want to be in any sort of financial squeeze is to be short. The “rising dollar” was little more than a(nother) “dollar” squeeze on the Brazilian, Chinese, Indian, etc., short. Only in Brazil, for a year the central bank offered a huge local currency subsidy (cupom cambial) for Brazilian banks to go even more “short” than they already were. 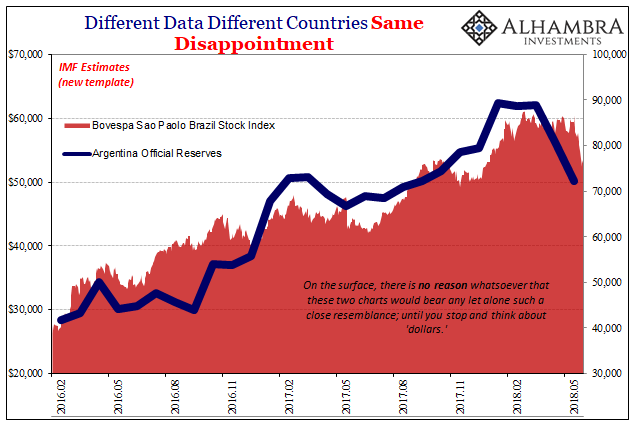 They did the exact wrong thing at the exact wrong time, and Brazil’s economy paid a terrible price for the mistake (to be clear, the economy was going to get whacked by the “rising dollar” no matter what, Banco had no chance to change that fate but they did make it worse by thinking they could stop BRL’s fall). Not only do they not know what they are doing, they are incapable of learning from their grievous mistakes. One reason why is that Economics and its outdated textbook offers them no alternate approaches. Right now, in a lot more places than Brazil and Argentina, the eurodollar is inside this central bank-inspired window of calm. Interventions have been sparked from China to the IMF to India. 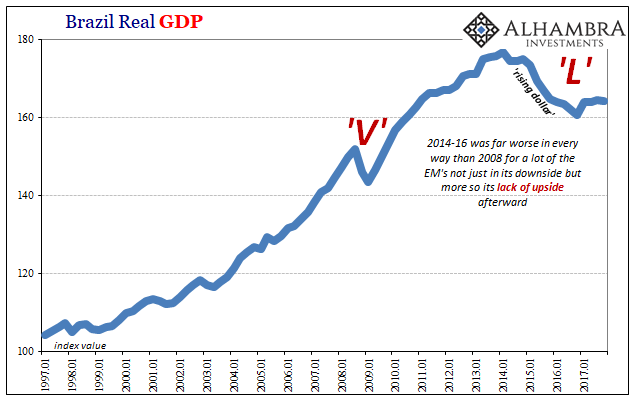 Nothing goes in a straight line if only because there are times when the central bank manual gives such absurd assurances to central bankers. Then the bill comes due and markets begin to realize they’ve gone and made it worse. Again.